Oh y'all, I'm so excited to announce some new additions to the CSW Designs shop today. 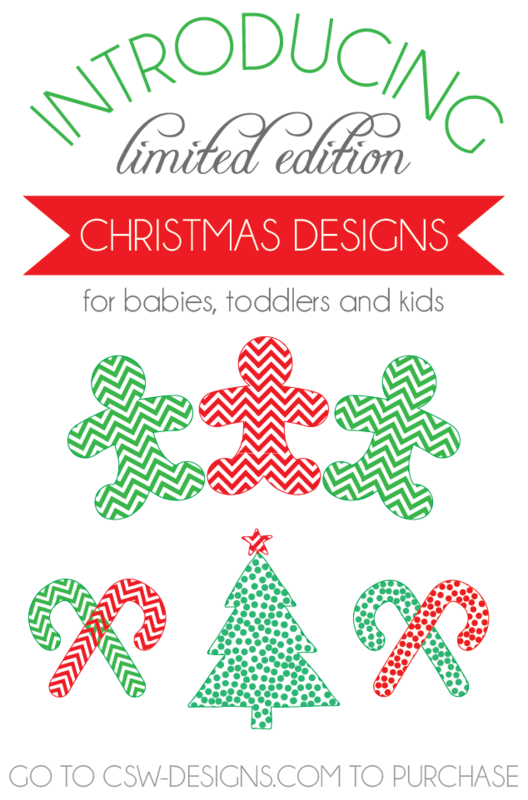 I've added three new limited edition Christmas designs and they're available not only on onesies, but on toddler and kids' t-shirts as well! I heard from a few moms that they love the designs, but their kids are too big for onesies. They requested t-shirts for their toddlers and bigger kids, so guess what? All of the modern-patterned animal designs are now available on toddler and kids' t-shirts too! So be sure and add CSW Designs to your Christmas lists for the kiddos in your life. To order, head on over here, select your design and style (t-shirt or onesie), and the item will ship right to you from the printer. I'm so excited about these designs that I want to give one away to one of you lovely readers! Use the Rafflecopter giveaway widget below to enter and spread the word! I would pick the pink polka dot giraffe or a green Christmas tree. Yay! No babies among my friends right now, but there are toddlers and children galore. Time to inquire about favorite animals before Christmas! Such cute designs. My fav is the bright blue chevron giraffe. Great designs. I love the simplicity yet playfulness! Vintage wash men's and women's garments are very similar to those with peach finishes. They are exceptionally soft to the touch and have a 'worn-in' look which is very comfortable, cosy and relaxed.